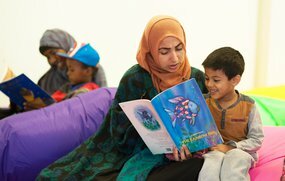 Personalisation can be a powerful tool to help support engagement in shared reading between parent and child and enhance a range of essential literacy skills for younger pupils. These resources aim to build the bridge between the emerging research and its practical application to improve outcomes for younger children. The A3 research poster The Power of Personalisation is an easily digestible summary of research in this area printable for whole-school display and discussion.